You’ve probably been slaving away creating a product you hope will generate passive income. Maybe you’ve spent time cultivating a following, growing your email list and building your blog in preparation for launching your signature product. With all that out of the way, the focus now becomes on sales. But, when 90% of product launches fail, for the budding entrepreneur, releasing a course, plugin, theme or some other digital product can ultimately make or break your business. The key is, if you can create buzz around your product then it’ll help drive sales. How do you do that without coming off as sleazy or turning off potential buyers? A while back, I released a freelance writing course and I’m able to generate sales from email marketing, webinars and affiliates. Let’s go into more detail on how to use different types of marketing strategies, and how to incorporate them into your sales funnel to churn out sales. In preparation for your product launch, it’s a good idea to build an email list of interested people who you can eventually sell to. Why? Because about 95% of people who land on your website aren’t thinking of buying. So all the efforts you put into your sales page, sidebar ads or call-to-actions won’t be as effective. Instead, a much higher conversion opportunity lies in your email list. In fact, you can have up to a 4,300% ROI strictly from your email list. That’s why it’s important to build your list early – before your product launch. But don’t get the illusion that once people are on your list they will automatically want to buy what you have to sell. Part of cultivating a list is to create warm leads. And a very effective method is to use a lead magnet that is highly specific and valuable to your buyer persona. By understanding your buyer persona, you can develop a lead magnet that will resonate with them and increase the likelihood that they will hand over their email address in exchange for your free incentive. The added benefit of using email as part of your sales funnel is that it allows for a more personal experience with your subscribers, giving you the opportunity to warm up your leads – sometimes without them really knowing it. This alone can increase sales by 20%. 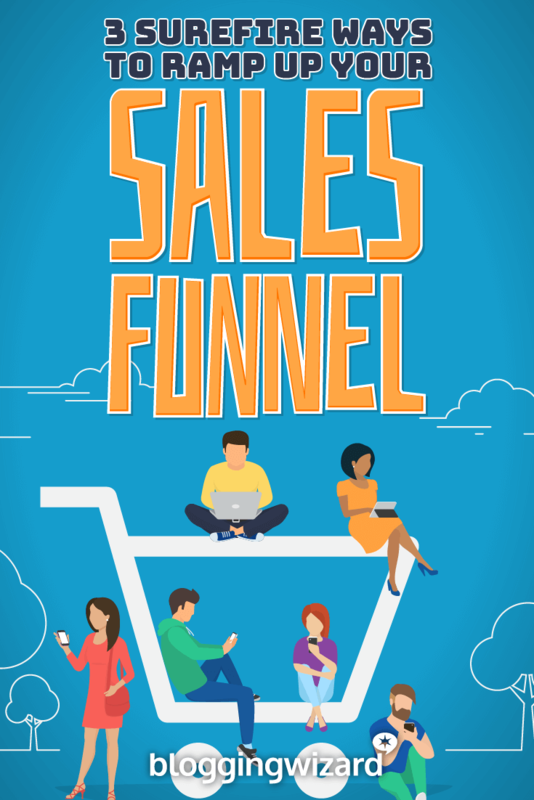 Two proven methods to consider incorporating into your sales funnel to develop warm leads are a series of welcome emails or an email course. Usually, when someone signs up to your list they either want to get to know you or your brand better, or they just really wanted your free incentive and nothing more. To start turning these new subscribers into warm leads, a successful method is through a series of welcome emails. Creating a welcome campaign can help drive 33% of your total email revenue. This helps familiarize the new subscriber with your blog, business and brand, as well as gives them an overview of what you have to offer. 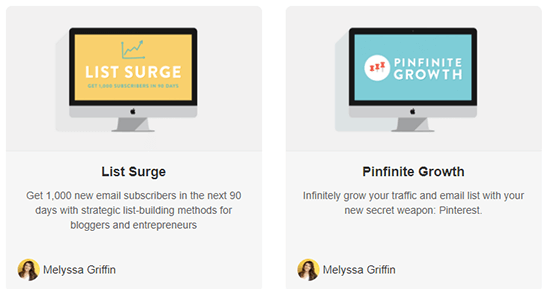 Melyssa Griffin has a series of emails that introduces new subscribers to her business – showcasing her credibility as an online marketer and outlining her successful products. After subscribing to her list she sends you an email of a case study, and a comparison of her two course launches. From there she sends you a series of emails on the course she’s currently promoting. Right now, it’s her Pinfinite Growth course. One email focuses on generating more page views in a month, and how her course can help you achieve the same results. Another email tells her subscribers about her first three blog investments and pitches her course at the end. By the end of the welcome series, you are aware of her expertise and products. One of the most popular and effective lead magnets is a free email course. Bloggers, entrepreneurs and marketers are moving away from the typical eBook and looking at other ways to incentivize their email list. And courses seem to attract a lot of email subscribers. Visitors feel that a course contains a lot of valuable information that’s bundled up in an easy-to-consume format like email. Using an automated email sequence, you can create a mini-course on a topic that you know your target audience is craving, interested in or wants to know more about. And by dripping your sales funnel over a series of days, many subscribers won’t realize you are selling to them. Instead, it’s packaged as a series of highly valuable and step-by-step instructions to help a subscriber accomplish a task. My email course for new writers is a free version of my paid course. It provides just enough information to help an aspiring writer get on the road to making money from writing. The next logical step is to buy my complete course, which gives you a step-by-step proven method to launching a successful freelance writing business. Over a series of ten or more emails I provide mini-lessons as well as follow-up supplemental guides once the course finishes. The subscriber can access free lessons from my paid course, learn what my paid course is all about, and then learn more about my credibility with the supplemental guides I provide – all delivered over the course of several weeks. One of the top five effective marketing strategies for lead generation is a webinar. Webinars are so effective that many creatives, freelancers, and entrepreneurs are generating more income in one day than what many people make in a week. Webinars can be joint ventures or done individually and when used as a lead-gen tool, they are often free to attend and provide valuable information to subscribers. If you’re using webinars as part of your sales funnel then part of your webinar will usually consist of a pitch for your latest product. For joint ventures, many co-hosts bundle their courses and services to provide more value for the subscriber. Jenna Soard of You Can Brand, was able to generate $5,000 from a joint webinar with Mariah Coz of Femtrepreneur. The kicker – only 30 people signed up to attend the webinar. Research shows marketers rate webinars as one of the most effective marketing strategies for small businesses. If you have a big enough list, a loyal following, and are seen as a leader in your industry, doing webinars can consistently bring in sales. An added benefit to doing webinars is how it can compliment your content marketing plan. You can repurpose your webinars into other mediums. For example, blog posts, a white paper, infographic, podcast or eBook. Doing this can reach more people, which means you’ll get more leads into your sales funnel. When deciding on doing a webinar, remember to focus on training and teaching your audience. It should be informative and educational. While you can host a webinar that goes on for many hours, typically you want to keep it to just around an hour to account for lunch breaks or appointments your subscribers might have. In typical fashion, after your pitch you would generally host a Q&A and answer any pressing questions your viewers might have. The most common platforms to host your webinar on are Google Hangouts on Air (free) or GoToWebinar. Wouldn’t it be great if you had other people promote your product and instead of them being on your payroll, you pay them based on performance instead? This is what an affiliate program is all about. It’s a marketing strategy where you pay people – who sign up to your affiliate program to promote your business – a commission when they refer a sale to you. Big companies like web hosting services to small solopreneurs are using affiliate programs to generate sales, grow their brand and reach more people. Hiring a team to market your product not only takes a toll on your finances, but it also takes up your time. The time it takes to train these people on top of the time it takes out of your schedule is a cost you don’t necessarily need to generate sales. An affiliate program is a cost-free marketing strategy that takes little time to set up and has the potential to reach people from all around the globe. I set up an affiliate program for my course and I have affiliates from the UK, the U.S., Europe, Canada and Africa. And depending on their target market, my course is being promoted in many different parts of the world. PPC and paid ads like Facebook ads can be expensive, especially for a small business or start-up. With your affiliate program, don’t be surprised if some affiliates buy advertising to promote your product. If you have a good product or service and the affiliate feels it makes financial sense, they will use money from their own pocket to promote your product. What’s great is when affiliates do social media or content marketing, advanced SEO or media buys, they can potentially bring a surge of traffic to your site. And you wouldn’t be paying for marketing, just for conversions alone. Affiliate programs have a low risk-to-reward ratio, making it a perfect endeavour for small business or solopreneurs. With low start-up costs, the potential to earn is practically limitless. What’s involved in setting up an affiliate program? You’ll spend some time in the beginning recruiting affiliates. You might contact people from your network and ask them if they are interested in joining your affiliate program – or you might ask influencers in your industry. Next, you need to either register your product or service with a managed affiliate platform (prices vary but can be significant), or you can install software on your website to run your own affiliate program. For eBooks, downloadables or courses – ClickBank, DPD or E-Junkie. Pricey, managed, hands-off solutions – Shareasale or CJ Affiliate by Conversant. Self-hosted but may require technical knowledge – iDevAffiliate, AffiliateWP or PostAffiliatePro (this post by Daryn Collier explains some of the options in more depth). From this point on, it’s up to you whether or not you provide marketing material such as emails, blog posts, banners, social media postings, or copy for promotional deals. Creating and launching a product can be an exciting time in your business – it’s the beginning of a new chapter of (hopefully) growth and success. But to extend the longevity of your product, it’s important you have different ways of consistently getting new leads into your sales funnel. By far the most effective use of your sales funnel lies in your email marketing strategy. You have a captive audience, so make good use out of your welcome emails and incentives. To further generate sales, invest in webinars. People love attending free workshops and they’re a great medium to share your expertise and engage with your target audience – as well as share your latest product or service. Finally, don’t discount using an affiliate program to generate consistent sales. It’s practically free marketing on a global scale.